Whether you’re who’s just lost all of your photos of a passed-away loved one or you’re a professional photographer who’s just lost an entire wedding shoot, Gillware is the best choice to make things right. One of the most common forms of data our engineers are asked to retrieve on a daily basis in our data recovery lab are photos. Whether it’s a household’s years’ worth of family photos, a professional photographer’s thousands of photos from a wedding service, or a hobbyist birdwatcher’s collection of photos of the majestic red-tailed hawk, the photos we so easily store on our computers, in our external hard drives, on our phones, and in our cameras are among the most precious forms of data we create–and create we do, an estimated over one trillion per year. When that data goes missing, you might feel devastated; as if those memories you’ve captured have been ripped away from you. You keep asking yourself, “How can I recover these lost photos?”, knowing the odds are slim that you can do it yourself. Not to mention, if you’re a professional photographer and such misfortune falls on you, this could strike a horrible blow to your career and your ability to sustain yourself through your work. But this is where Gillware’s professional recovery services come in. No matter how you’ve lost those precious photos, we here at Gillware can help get them back. Whether your computer won’t boot, your external hard drive has fallen to the floor, or the SD card from your camera or phone keeps showing up as blank or corrupted, or you accidentally reformat or delete your data, we have the tools and expertise to bring back your memories and put your mind at ease. Has a failed device been keeping you from valuable pictures? Gillware can help get them back. When you need photos recovered, you are probably thinking, “Which is the best photo recovery software?”. You want something you can use on your own to spare yourself a trip to your local computer or phone repair shop or a data recovery lab. You might even be looking for software online that can analyze your phone, flash drive, external hard drive, or other device and dredge up your missing files, without installing software to your computer. You want things cheap, convenient, and fast. You want an app or software tool for your mobile phone or your computer that will work quickly, be easy to use, and get your photos back. But do you want your photos recovered fast… or do you want them recovered right? When any one of the sensitive components–or multiple components–in your hard drive break down, only experts in a world-class clean room facility have the tools to repair them and salvage data from the drive. Failed hard disk drives will often fail to spin up. They can also make unusual beeping or clicking noises. To recover your photos from a failed hard drive, our hard disk recovery engineers often need to open it up in a contaminant-free clean room workstation. You could overwrite the same photos you’re trying to save. This is a pitfall far too many of the clients who come into our lab fall victim to. When you need to recover deleted pictures, you must avoid installing the data recovery software tool on the same device. When you accidentally delete a photo, it doesn’t immediately vanish, but your storage device does mark it as available space. When you write new data to the device (which you do when you install a new app or program, or even when you boot up the device) some of it may overwrite the same photos you’re trying to recover. Software can’t work around a hardware issue. If you’ve accidentally deleted photos, that’s one story. If photos have become corrupted, or you can’t access the phone, memory card, or external USB hard drive due to a USB not recognized error, that’s another. That’s the kind of hardware failure your software most likely lacks the tools to deal with. Running software on a device with an underlying physical error can worsen its condition, causing even further damage and data loss. With free photo recovery apps, you just might get what you pay for. Photo recovery apps are designed to do one thing: recover photos. Whether they do their job well is another matter altogether. While you’re bound to find a diamond in the rough once in a while, when you use cheap or free recovery tools for Android phones, iPhones, Macs, or PCs, you’re using tools that lack the robustness to get the job done in all but the simplest and easiest of data loss situations. Recovery software for mobile phones and computers can help you out, but often it’s best to trust the experts. At a professional data recovery lab, you can count on people with years of experience to recover lost photos from all sorts of data storage devices. This includes photo recovery from Mac and PC systems, Androids and iPhones, USB and memory card devices. Our experts are adept at recovering photos that have been accidentally deleted and recovering photos from reformatted storage devices as well as recovering corrupted photos and photos lost due to hardware failure or physical damage. We use extremely robust data recovery tools of our own design far surpassing the capabilities of most consumer-available recovery tools. The delicate process of "spiderwebbing" an SD card in order to recover its data. People don’t often think about how hard the hard disk drive inside your computer or the external hard drive sitting on your desk works to store your data. But work hard they do, and the components inside your hard drive are delicate and complex. Hard drives can fail when subjected to physical trauma, such as being dropped, or to a sudden loss or surge of power. They can also fail due to old age or factory defects as their parts wear out. Many of the photos we take today end up on the SD cards inside digital cameras or the tiny microSD cards inside mobile phones. These devices don’t store data the same way hard drives do; instead of spinning disks, these use chips of NAND flash memory. 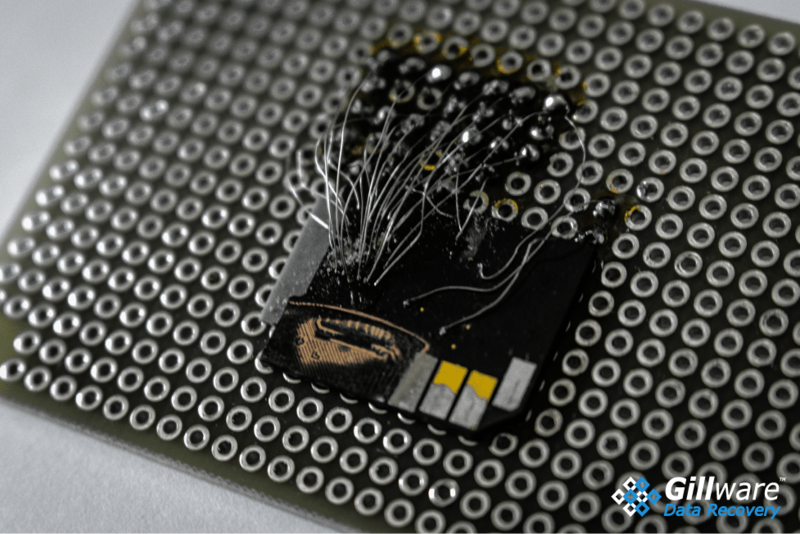 When these devices fail and make your photos seem to go up in smoke, it takes engineers with expertise in repairing failed SD cards and microSD cards to salvage data from them. Mobile phones store more precious and meaningful personal data than ever before. For many of us, phones have replaced cameras altogether. Most of us have hundreds of photos taken on our phones that never leave the removable SD card or internal eMMC chip inside our phones. When our phones die on us, the data on them may seem lost forever. At Gillware, our phone recovery experts work to recover data from mobile phones as part of recovering photos. At Gillware Data Recovery, our engineers constantly encounter situations in which people need photos recovered have accidentally deleted their photos or reformatted their device, seemingly wiping it clear of all data. Many software tools exist to help users recover deleted photos. But few widely-available software tools come equipped to handle difficult situations involving deleted data. Our logical data recovery experts have extensive experience with Windows, Mac, and Linux filesystems. We know where data lives and where it goes when it gets deleted. Why Choose Gillware to Get Your Photos Back? At Gillware Data Recovery, we provide affordable, financially risk-free photo recovery services. When you have a broken hard drive, SD card, or phone on your hands and you want professional data recovery experts to handle getting your photos back, choosing Gillware is the best choice you can make. Gillware’s recovery services are completely financially risk-free. Our data recovery process starts with an evaluation of your storage device, with no upfront costs. We even offer to cover the cost of inbound shipping, via a printable, prepaid UPS shipping label provided for customers in the continental US. After we finish evaluating your data recovery needs, we present you with a firm price quote. We only go ahead with our recovery services once you approve our quote. We work with you to determine your goals for recovery. After we’ve recovered everything we can, we only charge you once we’ve successfully met your goals. As part of our “no data, no charge” guarantee, you owe us nothing if we cannot recover enough of your valuable photos.